Bouncing along the waves on a jet ski can be terribly dull, so electric vehicle company Nikola Corporation has come up with a solution: embed a waterproof 12-inch 4K display in the dash to distract you from all that tedious scenery. 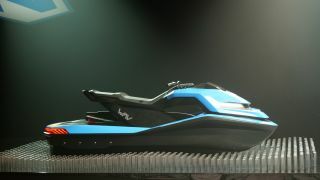 The Nikola Wav (which The Verge reports is pronounced 'wave') takes its inspiration from sports bikes, and features such unusual goodies as LED lights and cruise control. The Wav isn't just a concept either – Nikola is taking reservations (though it isn't divulging the price yet) and hopes to start shipping in the mid-2020s. The Wav was one of five zero-emission vehicles Nikola unveiled at an event in Arizona on Tuesday. The company also took the wraps off two semi-trucks (the Nikola Two and Tre) and the Reckless, a military ATV. For those with a taste for fun, it also revealed an electric off-road vehicle called the NZT, which stands for Net Zero Toll and resembles a dune buggy crossed with a Smart car. Like the other vehicles on show, the NZT is fully electric. It boasts a range of up to 150 miles, front and rear cameras, a low center of gravity for stability, 3,000lb towing capacity, and a 13-inch infotainment display for those dreary moments on the dunes. The NZT is also fully waterproof, and can be safely submerged up to a meter, meaning it won't be troubled by snow or wet crossings on the trails. It's available to reserve now with a starting price of $80,000 (about £60,000 / AU$112,000), and is expected to go into production in 2021, giving you a little time to save up.